Here’s what happened when I was listening to Prammi, from Icelandic ambient/post-rock outfit Stafrænn Hákon, fronted by Ólafur Josephsson. There I was, cooly grooving along to some jangly guitars and indie-rock edge, feeling like I wanted to be chilling somewhere near the water with a cold beverage (because this, apparently, is how I take my post-rock) and just soaking in the sounds, when after a few tracks, things…changed. I found myself adrift in a sort of whispering-wind flow of guitar drones and I thought, so this is where we’re going. But no–after a few minutes I was quietly deposited back in front of that post-rock outfit for a couple more songs before things changed again. The thing about Prammi is that it not only offers two different takes, it hits both of them spot-on. The post-rock work has a bit of a gritty edge to it, a garage-band, late-night jam feel. “Klump” and “The Son” recall the lo-fi vibe of Sebadoh, down to their wispy lead vocals, with “Klump” adding a borderline bluegrass tone beneath the more straight-on rock. “Hvarf-12” shuffles out its blurry-eyed, 2 a.m. shoegaze beat over wobbling tremolo guitars. An underlying drone offers a static-buzz baseline. And whether you speak the language or not, the charming lilt of “Raekjuhals” will stick in your head. With its mandolin and chimes, it’s like a musical smile, and it just infuses you with a dose of feel-good. On the ambient side, that first wash of drone, “A Personal Voyage to Meat Planet” (which is a great title), lays the foundation for the other tracks of its kind. It’s deep and warm, fuzzed out and hissing quietly in your ears. I was surprised to look over, out of my light hypnotic haze, and discover that it’s just three minutes long. It’s a time-stretcher. “Passage” takes the same route, adding in a slightly rougher texture and more distinct sense of movement. It’s shadowy without being dark, with a wonderful tentative sense hiding in the sound. The closer, “Wait,” ups the hold-your-breath ante. This is a very deep drone, quite mechanical, peppered in spots with the call and clatter of distant chimes. It’s the blend of styles, obviously, that gives Prammi such unique character. And the thing is, I would listen to a full disc of either side of the equation. The post-rock lifts my spirits and satisfies the old indie rock guy in me, and the drone work is good food for my ambient soul. So it’s a win-win. 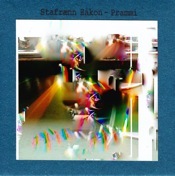 You need to check out Stafrænn Hákon’s Prammi. Available from Sound In Silence. Stephen Dubois: 2012: Prophecy of Doom?